Who else scored their $0.69 per lb. Foster Farms whole chickens at Ralphs after I posted a couple days ago?! Well if you haven’t you NEED too. Then you can make this amazing Honey Barbecue Roast Chicken, and I mean why would you NOT want too?! It has the perfect balance of sweet, spice and oh so tender. I have been making this recipe for years and it is a staple in our home. The scent alone while this cooks will make your mouth start watering! In case you missed my previous post, Ralphs 5 Day Sale is going on now until Sunday 1/22. 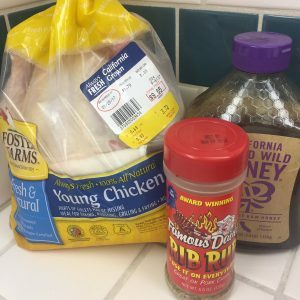 Foster Farms whole chickens are just $0.69 per lb., which made this chicken just $3.72 and would easily feed a family of 5. Also, keep in mind you can freeze these whole chickens, so great time to stock up! Remove giblets from inside the chicken. Generously rub Famous Dave’s Rib Rub all over chicken (you may add more to your liking. I tend to add about 4-5 Tablespoons so the chicken is well coated). Sprinkle salt over. 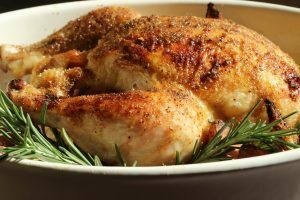 Place chicken in a roasting pan and drizzle with olive oil (I use an olive oil spray which makes it a little easier but either way works). Put foil over chicken place in oven. 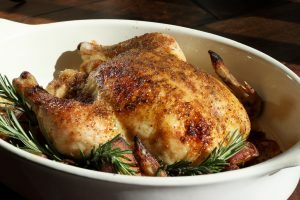 Roast chicken for 1 hour. Take foil off chicken and roast uncovered for 15 mins. Stick a meat thermometer into the center of the chicken and if the temperature reads 180 degrees, it is done. It may need to cook a little longer as different ovens range in temperature. Remove chicken from oven and brush honey all over the skin right out of the oven. Let chicken rest for 15 minutes. Tip: The best way to make your chicken extremely moist is to cook your chicken breast side down (or upside down). The juices will run into the breasts which makes your chicken extremely moist. I cooked it normally for photography purposes only. Ralphs provided me with compensation in exchange for this sponsored post. However, all of the opinions expressed here are my own.